A NEW wireless event photography APP for use with iOS, Android phones, and tablets. 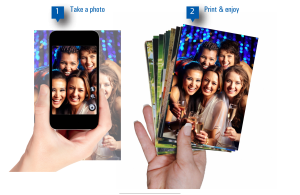 Mobile Party Print (MPP) is a new mobile imaging solution from DNP for event photographers. Install MPP on a compatible Window’s PC, configure your Wi-Fi router, connect a DNP printer, and you are ready to go! MPP makes a great rental solution for parties, wedding receptions, or other hospitality events. From click to print in less than 11 seconds! Easy - MPP allows event guests to easily transfer photos via Wi-Fi for instant printing and sharing. Download the FREE app Wi-Fi and print. Fun - MPP is the modern version of free film cameras on the table. Event guests use their mobile devices to capture memorable candid shots. Archive - MPP archives all of the images that it prints so event hosts can receive copies. Versatile - MPP can be customized. Create a start page that every guest will see each time they run the mobile application. MPP can also add a graphical border to each print. Print Sizes DS40 4"x6", 5"x7", 6"x8", 6"x9"